This DAkkS calibration certificate means your volume flow hood is calibrated for volume flow measurement. Calibration is carried out according to the DAkkS standard. Wherever measuring instruments and probes are used in quality-related areas, calibration of this equipment is required. This is because even the smallest measurement errors can have critical consequences. This DAkkS calibration certificate for volume flow (suction or blowing) means your volume flow hood is calibrated at the measuring points you require. The selected measuring points must be within the 15 to 2000 m³/h range. If you do not want to have a free choice of calibration points, you can also order a DAkkS calibration certificate with specified measuring points. We offer certificates with 5 or 10 measuring points (0520 0264, 0520 0294). 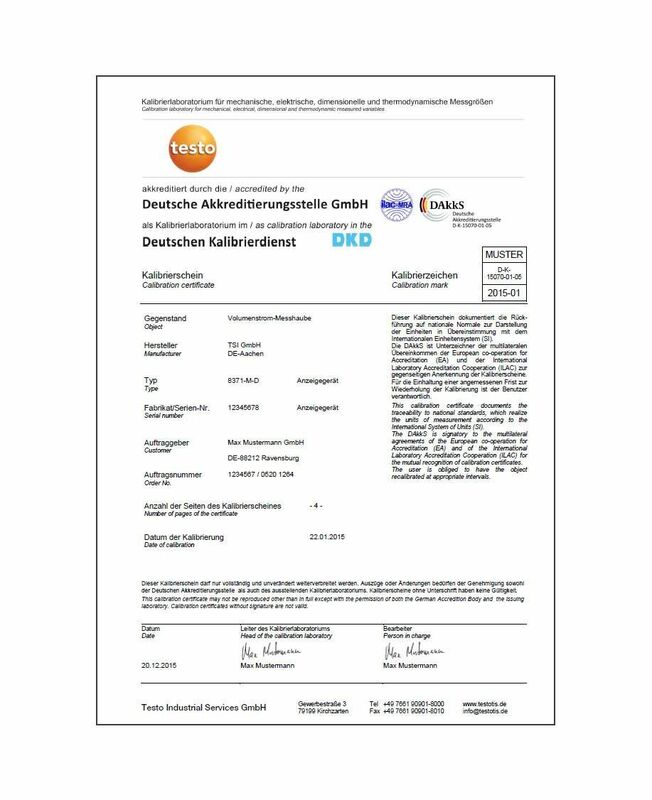 DAkkS calibration certificate for volume flow with selectable measuring points in the 15 to 2000 m³/h range.